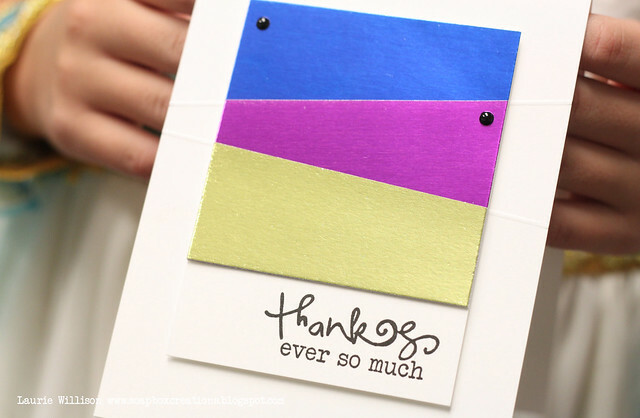 We have a new sponsor, Verve Stamps, for the Curtain Call Inspiration: Boho Bright! A randomly selected participant in the Boho Bright challenge will receive a $30 gift certificate to use at Verve Stamps, while the LEAD will be invited as a Guest Designer in a future challenge! When I heard our theme for this week was called Boho Brights, one look at that inspiration photo made me think....foil paper. I just layered up a few of the colors from the photo and then added some black enamel dots for detail. I kept it super simple as usual. I added this adorable thank you sentiment from Verve, and then attached the foil paper panel to the front of the card base. I attempted to photograph this card 5,412 times because of the foil. It was SO hard to get an accurate picture of the foil color. So in this picture Cleopatra held the photo for me....just incase you were wondering what my card model is wearing. lol! 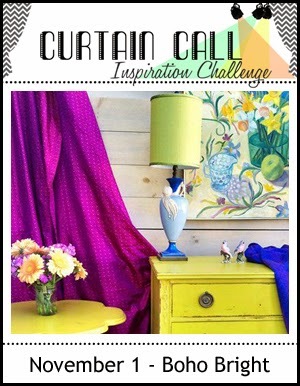 Stop by the Curtain Call Inspiration Challenge: Boho Bright for the challenge details and to play along with us! What a graphic card Laurie. Love the way you used the colors. Love those bright colors and the angles, great modern CAS card! Just so brilliant! Cleo.. I see a future in hand-modeling! Hahaha! Photographing foil and acetate are my worst nightmares! Glad to hear I'm not the only one. Love the graphic, clean lines of your card. Cleopatra made a great card holder. I love your layout. Loving this card, even more now that I know it's foil. Great design. Have a bright and merry!